2005-03-08. New. Ships with Tracking Number! INTERNATIONAL WORLDWIDE Shipping available. Buy with confidence, excellent customer service! Oxford Clarendon Press, 1959. This is an ex-library book and may have the usual library/used-book markings inside.This book has clothback covers. In poor condition, suitable as a reading copy. Oxford University Press. PAPERBACK. 0192852930 New Condition. . New. Oxford: Oxford University Press, 1959. Second Edition edition. Hardcover. Fair/No Jacket. 22 Cm. No Jacket Ex-lib hardcover, fair condition, w. the usual stamps, marks, labels, pockets. Smwht rubbed brds, marks. Wear at edges. Sp, ltly slanted covered and repaired w. tape. Bumped and frayed corners, tanned, ltly soiled pp. Fr ins hinge starting. Boards . ISBN: B0006AVULC. Catalogs: History. Oxford: Oxford Uni. Press, 1988. black cloth, slight rubbing, inc. b/w maps, 539pp. 2nd Edition 11th Reprint. Hard Back. Very Good/Very Good. 40 x 150 x 220mm. Oxford, Clarendon Press, (1976).. Second Edition. XXVI, 539 S. Mit mehreren Karten und Stammtafeln. 8°. Originalleinenband mit Rückengoldtitel.. Einband leicht bestoßen. Sonst gutes, sauberes Exemplar. Oxford: Clarendon Press, 1952. Reprint of first edition of 1936. Hard covers, dust jacket. V.g./Good. Jacket with very small tears at top edge, owner's discreet inscription on ffep. 448 pp., several maps, charts and figures at end. Other: Other. Very Good. Hardcover. 2nd ed, Oxford, 1959. 599 pages, clothbound, very good condition, no jacket. .
Oxford Clarendon Press, 1936. This is an ex-library book and may have the usual library/used-book markings inside.This book has hardback covers. In fair condition, suitable as a study copy. Oxford, United Kingdom: Oxford at the Clarendon Press, 1988. 539pp. Maps. From 'The Oxford History of England ' series. Volume VIII. Spine a v. trifle sunned. A nice copy.. second edition reprint. Blue cloth, gilt. Fine/Fine, spine faded. 8vo - over 7¾" - 9¾" tall. Oxford University Press, USA. Used - Good. Ships from the UK. Former Library book. Shows some signs of wear, and may have some markings on the inside. 100% Money Back Guarantee. Your purchase also supports literacy charities. The Clarendon Press. Used - Acceptable. Ships from the UK. Former Library book. Shows definite wear, and perhaps considerable marking on inside. 100% Money Back Guarantee. Your purchase also supports literacy charities. Oxford University Press, 1959-12-31. Hardcover. Good. Oxford: Oxford University Press. Hardcover. 0198217013 pp xxvi, 539 . Fine. 1985. 2nd Edition. Oxford: Clarendon, 1965. hardcover. very good. Maps and genealogical table at rear. xxvi + 539 pages, thick 8vo, grey cloth. Oxford: At the Clarendon Press, (1965). A very good copy. Oxford: OUP, 1987. this copy dated,1987,original cloth hardcover,maps,539 pages,fine in fine unclipped dustwrapper.H.. Reprint. Hardcover. Fine/Fine. 8vo - over 7¾" - 9¾" tall. Oxford at the Clarendon Press, 1963. Second Edition. Hard Cover. Very Good/Good. Second edition. Includes original jacket. Moderately rubbed & toned, front jacket flap corner clipped, ink name on front endpaper, spine toned. 1963 Hard Cover. 539 pp. 8vo. Fold-out maps. Few rulers have impressed themselves so forcefully on the memory and imagination of their people as Queen Elizabeth I. 'Elizabethan England' was, in a very real sense, Elizabeth's England, and the country she left behind when she died was a kingdom that had won a commanding position among the great powers of Europe. 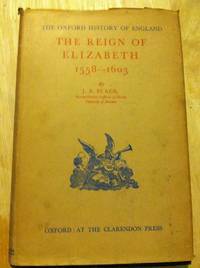 This book, first published in The Oxford History of England covers all aspects of the reign of Elizabeth, encompassing social and cultural history as well as political and economic. Among the principal issues it deals with are the Religious Settlement, England's relations with foreign powers, notably France and the Netherlands, Mary Stuart's challenge to the succession, the Armada, and the Irish problem. In the sphere of the arts, particular attention is paid to drama and poetry, and developments in the sciences are also discussed. Oxford: OUP Oxford, 1992. this copy dated 1992,original cloth hardcover,maps,539 pages,private booklabel to inside of front cover otherwise fine in fine unclipped dustwrapper.. Reprint. Hardcover. Fine/Fine. 8vo - over 7¾" - 9¾" tall. Condition: Very Good - in Very Good Dust Wrapper. Gently faded at the spine of the dust wrapper. Oxford at the Clarendon Press | Oxford University Press, 1988. Book. Very Good. Hardcover. 8vo - over 7¾ - 9¾" tall. 2nd edition. Some foxing to the top closed textblock edge. Otherwise in excellent condition throughout. The dust jacket is supplied by us in a loose protective clear archival film sleeve (which does not adhere to the book or jacket in any way and protects the jacket against wear). pp. xxvi, 539, maps and tables. A HEAVY book - a postage surcharge will apply to delivery destinations outside the UK as this book costs more to send than our standard postage rate will cover. NO additional charges for sending within the UK..
Oxford University. Used - Very Good. 1987. Oxford. 1987. Cloth, DJ. Octavo. 539 pp. + maps and charts. Hardcover. Very Good. Sold by the registered U.K. charity Langdon: Supporting disabled young men and women. Oxford: Clarendon Press, (1952). Blue cloth. Ex-library, cracked rear hinge reglued, covers scuffed/rubbed, especially at extremities, occasional pencil underlining/marginalia: Good reading copy/no dj. 8vo. 7 black & white maps + 3 genealogical tables.. of the series: 'The Oxford History of England'. Oxford At The Clarendon Press. Hardcover. ~Good. No DJ. Hardcover. Ex-Library. Academic library markings/stamps; light to moderate shelf wear; satisfaction guaranteed. . Good.